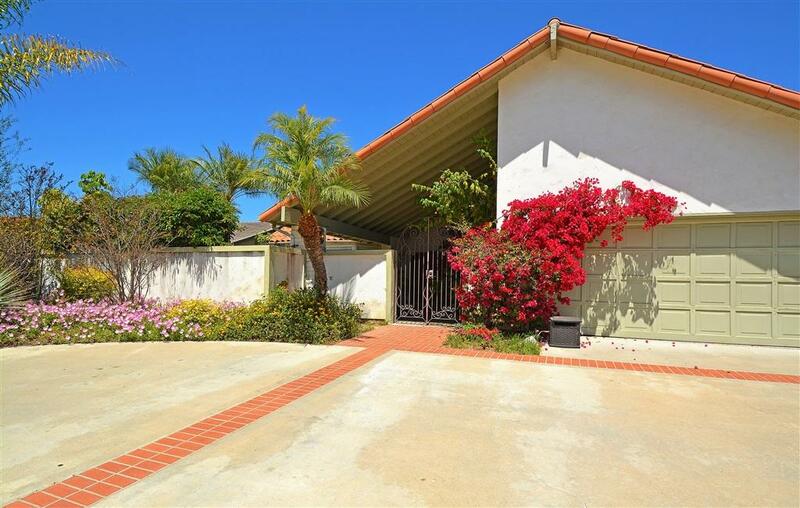 Lovely ranch-style La Costa home in Carlsbad with impressive curb appeal, bright open floor plan, wood, tile, and carpet flooring. Upgrades: Modern ceiling fans, gourmet kitchen with dining bar, new stainless steel appliances, custom cabinets, & custom paint all accompanied by panoramic views of La Costa golf course & surrounding hills. Master bedroom has similar view & luxurious ensuite with tile, marble counters, and elegant glass enclosed shower. Lush & shaded back patio has built-in BBQ & fruit trees. 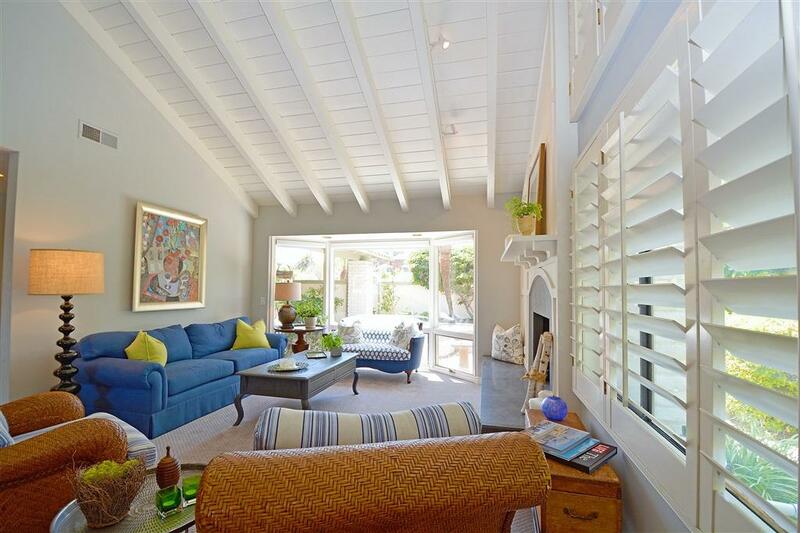 This lovely Carlsbad ranch style, 1936 SF single family home is located in the exclusive La Costa area of Carlsbad, CA. The home has an impressive curb appeal and features a light and bright open floor plan, wood, carpet and tile flooring, plantation shutters, numerous modern ceiling fans, cathedral/open beam ceilings, gourmet kitchen with dining bar, custom cabinets, granite counters, all new stainless steel appliances, and custom paint throughout. The panoramic view of the La Costa Resort golf course and the surrounding hills is nothing short of spectacular! The home is offered as an unfurnished long-term (12 month lease) rental (furniture in photos is owner's and will be removed prior to tenancy). 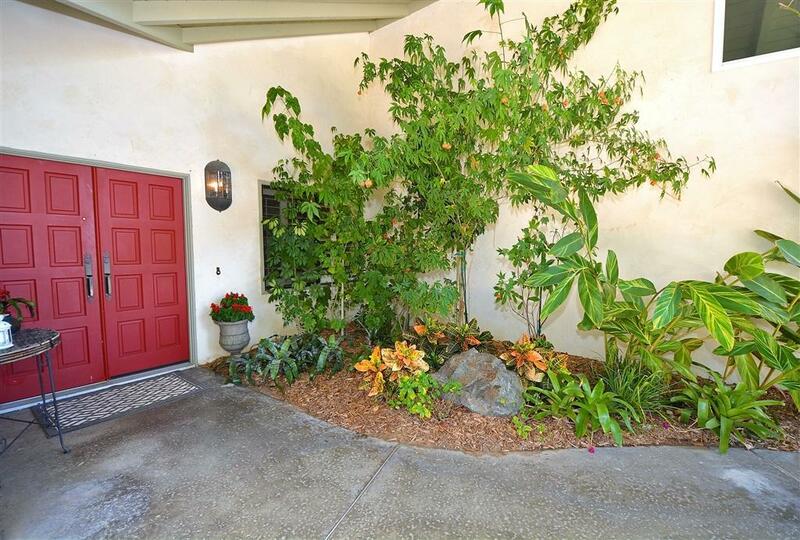 Enter the home through the flower lined circular driveway and courtyard entry into the large living room with vaulted and open beam ceilings, fireplace, and huge window view of the lush and tropical front courtyard. The cozy family room is open to the kitchen with a huge window showing off the panoramic view and sliding glass door to the outdoor living area. The master bedroom has a similar stunning view and luxurious ensuite master bathroom with travertine tile, custom cabinets, marble counters, large tub, and elegant glass enclosed shower with conventional and rainfall style shower heads. Two other bedrooms and a bathroom are also part of the single floor living area. An additional 350 SF loft in the garage can be configured as an optional bonus room/garage (not included in SF) The backyard area includes a covered/shaded patio for outdoor seating and dining, with inlaid tile, built-in BBQ, lush tropical landscaping, roses and fruit trees, all maintained by an automatic sprinkler system and gardening service included in the rent. 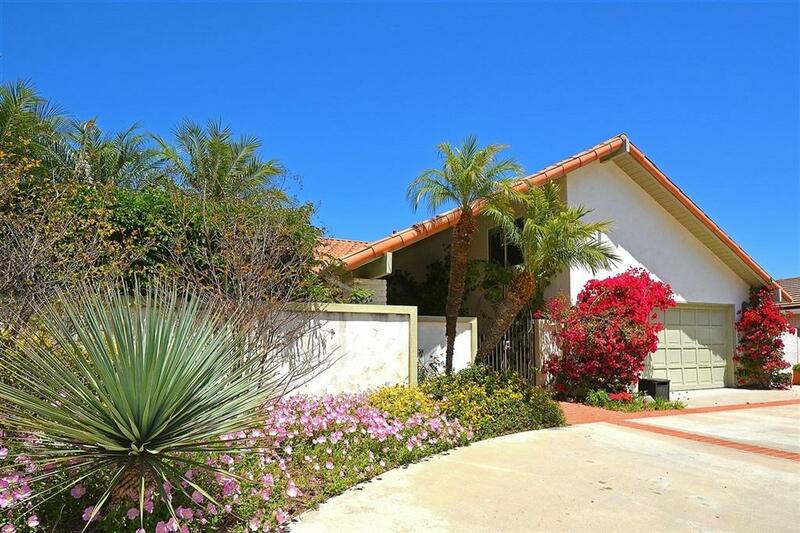 This property is situated in the La Costa neighborhood of Carlsbad South within the highly rated Encinitas Union and San Dieguito High School Districts (La Costa Heights Elementary School; Oak Crest Middle School, and La Costa Canyon High School). It is also just minutes from Carlsbad State Beach and Ponto Beach, the Carlsbad Village, LEGOLAND, La Costa Golf Resort and Spa, and a quick drive to San Diego favorites such as Del Mar race track and fairgrounds, Torrey Pines Golf Course, Sea World, historic Old Towne, the San Diego Zoo, Petco Park and the Downtown Gaslamp District. Commuting is easily accessible with nearby access Interstate 5. Trips to unspoiled Solana Beach, Cardiff by the Sea, Carlsbad or stunning Torrey Pines State Reserve and Torrey Pines Golf Course are also within convenient distance.